Transport for London have issued a draft map of cycle routes mimicking the iconic London tube map. The routes suggested follow tube lines such as Victoria and major bus routes using a combination of TFL bike routes and often unknown motor traffic restricted roads and lanes. Johnson aid “These are your secret cycling passages through London, taking you everywhere you need to go, directly and easily, using routes you might never know existed until we showed you. 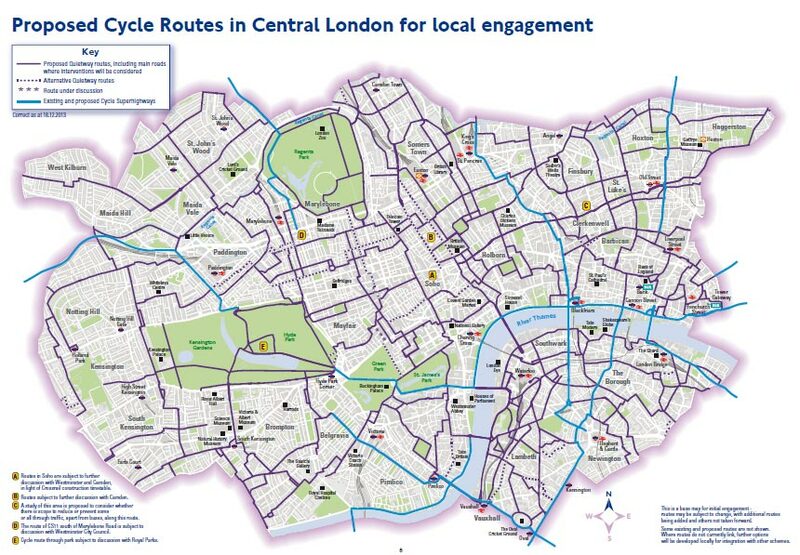 The London Cycling Campaign say that the Grid routes will be mainly on streets controlled by nine central London authorities (seven boroughs, the City, and Royal Parks), with approximately 25% of routes having protected lanes, and 75% being streets with low-volume and speeds of motor traffic. The protected routes include elements of existing and proposed Superhighways, including a new east-west Superhighway along the Embankment and a north-south Superhighway from Elephant & Castle to Kings Cross. Although welcoming the Central London Grid the LCC issued a press statement emphasising the need for safe and convenient junctions and high-quality routes that cater for all cycling abilities. LCC Chief Executive Ashok Sinha said, “We strongly welcome the Mayor’s assertion that increasing cycling in Zone One benefits all Londoners through reduced traffic congestion, reduced crowding on public transport, and less noise and pollution. “We’re delighted the Mayor’s stated aim is that the Grid will be suitable for everyone to cycle, including more women and children, who are currently massively under represented among London’s cycling population, often because of fears over safety. The LCC will be responding to the draft proposals before the 14 January 2014 deadline, and our network of local LCC groups will continue to work with borough transport officers and Transport for London to provide them with the views of local cyclists. 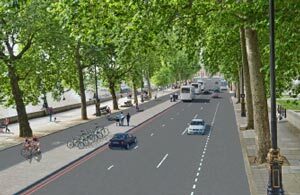 – Welcoming the opening of the contraflow bus lane along Bloomsbury Way to cyclists as an interim solution to improving cycling safety, but are calling for the Holborn one-way system to be removed entirely. – Junctions to create minimal delay for cyclists by ensuring signals have the same as or higher priority than motor traffic. – We reiterate our policy that cyclists should not be forced to share streets when volumes or speed of motor traffic are above 2000 PCUs (passenger car units) or 20mph.